Your favorite gold necklace that was handed down from your grandmother has broken, and you’re heartsick. What do you do if something like this happens to you? Don’t worry; call Kimberly’s Jewelers. 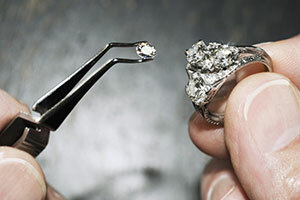 We perform the jewelry repair Fort Walton Beach and surrounding areas have been trusting for years. We repair white and yellow gold, silver and platinum jewelry, and we’ll fix your grandmother’s necklace so well that no one will ever know it broke. Along with repairing broken links in necklaces, we can restring those precious pearls that were an anniversary gift, resize rings, rebuild estate jewelry, and replace or reset stones. No matter the type of problem you have with broken jewelry, let the specialists at Kimberly’s Jewelers make those delicate repairs. You don’t want to throw your jewelry into a jewelry box never to be worn again. Those necklaces, bracelets and rings were meant to be enjoyed, so let Kimberly’s Jewelers take care of repairing those broken pieces. Our repair department is the most extensively trained, and we have the most modern equipment within 500 miles. If we can’t do it, no one can. While we sell fine jewelry, we make repairs because we know things happen that can frustrate you. When something happens to a piece of your jewelry, think Kimberly’s Jewelers for all your jewelry repair services.